After graduating from the Royal College of Art with a Master’s Degree in Goldsmithing and Silversmithing in 1993, Diana set up her studio in London in 1994 with the aid of a Crafts Council Grant, successfully designing and making jewellery and silversmithing for shows and galleries, nationally and internationally. Diana won the P&O Makower Silver Commission for the Crafts Council in 1995 and in 1996 was named best newcomer at Chelsea Crafts Fair. She exhibited regularly in group exhibitions and at major crafts fairs with both her jewellery and silversmithing and was commissioned to make cutlery for the ‘Sheffield Millennium Canteen’ in 1997. 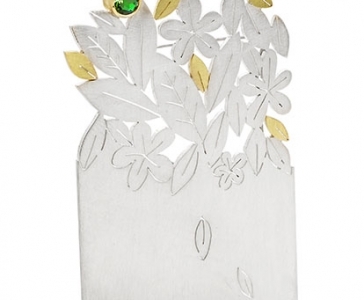 Diana’s most recent work concentrates on jewellery (predominantly in silver, though sometimes with gold and semi-precious stones) and framed boxed pieces; her fascination with the garden and the process of gardening feeding her passion for working in metal. 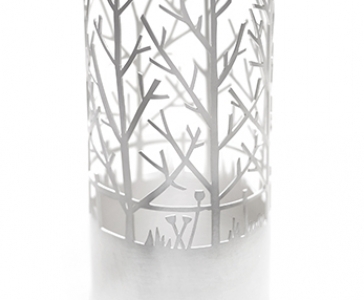 Diana also made a recent return to silversmithing, showing her newest silver piece at COLLECT at the Saatchi Gallery in May 2013, as part of the Bishopsland Collection.